The first snowfalls have begun in most of the northern countries and it is the perfect season for skiing and snowboarding. Especially for those who will be travelling for the holidays and spend time at a ski resort up in the Alps. Jackets are the main thing to consider and look into during this season and especially for the aforementioned activities. There are numerous designs to go through, but who really has the time? That’s what we are here for, as always, with our selections of some great jackets for you. Today’s selection includes jackets not solely for men and women, but also kids. So if you are travelling as a family, then this is the article for you. 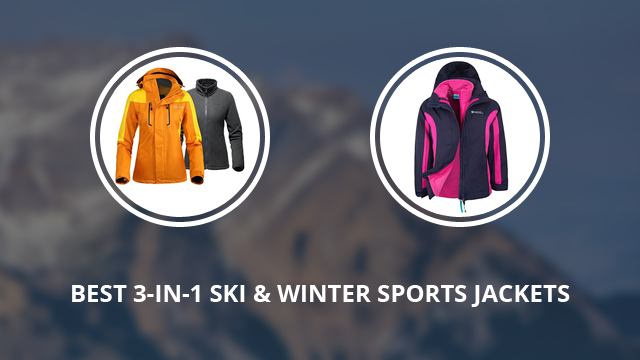 Let’s get started with 8 of the best 3-in-1 ski jackets on the market! First up is this fleece-lined jacket by OudoorMaster. The inner lining is 100% Polyester fleece that provides great insulation. It is designed for comfort and can be worn indoors too, for when the temperatures really drop. It comes with two side pockets and Teddy fleece lining on the collar. As for the outer shell, it is waterproof and also stain resistant. The water rolls off the jacket rather than pooling on top and the hood comes in handy when it’s raining or snowing. The sleeve cuffs are adjustable by Velcro fasteners and the main zipper is protected by a storm placket on top. It is designed specifically for skiing as the pocket placement and the zippers on them are quite practical and can be easily accessed with gloves. The hood is also removable for when you will be wearing a helmet. There are 3 colors available: Deep blue, Desert and Olive green. 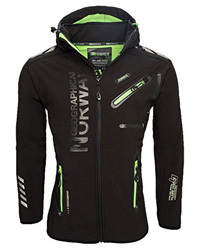 The next jacket for men is by Mountain Warehouse, the Thunderstorm design. 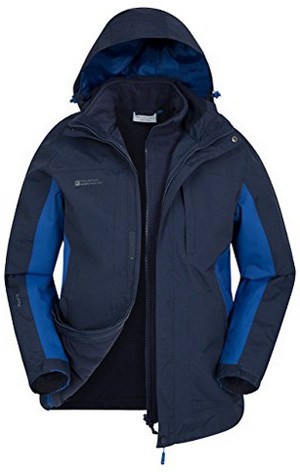 This jacket is made of Polyester and comes with a waterproof outer shell and taped seams. 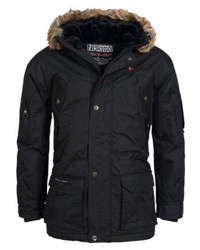 It has an adjustable hood and a high collar on both the inner and outer jacket. The inner fleece jacket is really warm and insulated for perfect temperature control, while the outer one is quite breathable as to prevent overheating. The fabric is also anti-pill and the fleece layer comes with two side pockets as well. There are three outer pockets, adjustable cuffs and the main zipper is covered. It comes in 2 colors: Navy and Cobalt. The next men’s jacket is a very interesting design by Wantdo. 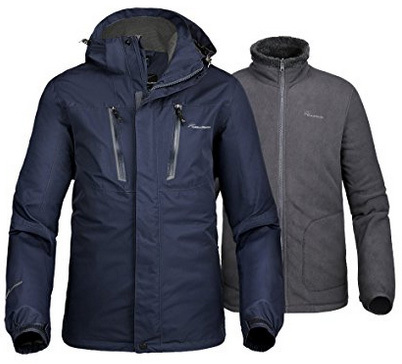 The outer layer comes with a detachable hood, high collar and adjustable sleeve cuffs. The main zipper on this layer is covered and highly resistant against water. 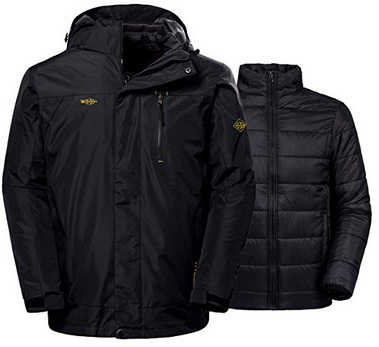 It is waterproof and windproof, with three zipped pockets on the outside and one on the inside. As for the inner layer, this is what differs this jacket from the previous ones. It is actually a puff layer with great insulation and warmly lined on the inside. That’s what makes this jacket suitable for harsh winters. It is available in the colors: Dark blue, Grey, Army green and Black. We’re starting off the women’s selection with a jacket by OutdoorMaster, too. 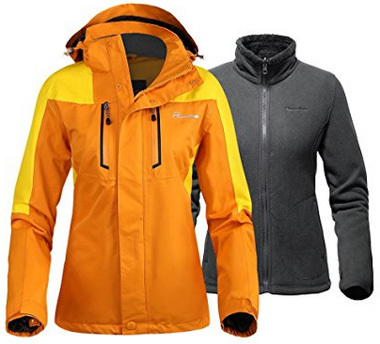 It comes with a waterproof outer shell, which is also very breathable. This comes in handy in combination with the fleece lining, which tends to insulate and could lead to overheating on its own. That’s why breathability is so important in a good ski jacket, since you will be moving around quite a lot. The detachable hood is suitable to be worn under a helmet and the two vertical pockets are practical for carrying your ski pass or phone. The inner layer is made of soft fleece and comes with two side pockets. This jacket is purchasable in 6 vibrant colors: Lime, Ocean green, Papaya orange, Pink, True red and White. 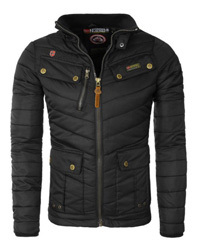 By LEAJOY we have selected this 100% Polyester jacket, which comes with the Omni-Tech membrane. We have previously mentioned Omni-Tech extensively and its one of the best fabric technologies for outdoor clothing, especially those for sports. This is a waterproof membrane that is also highly breathable. Breathability is also provided by the inner lining of the outer layer, which is a mesh lining that also helps keep the jacket lightweight. The seams on this jacket are taped and it comes with lined hand pockets on the outside and a storm hood that can be detached. 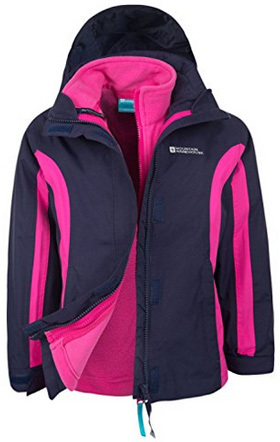 The inner layer is made of 100% Polyester fleece and the jacket is available in the colors: Orange, Cherry, Turquoise, Violet, Apple green, Fuchsia and Light pink. The next jacket for women is by KAISIKE, a water and windproof jacket with a removable storm hood and adjustable cuffs. The inner layer is made of fleece that provides great insulation in combination with the plush lining on the inside. 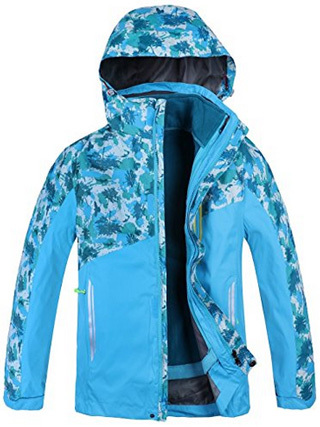 It is a versatile jacket, which due to the breathability and practical design, can be worn in a variety of sports such as cycling, hiking, fishing, etc. The main zipper is covered by a storm placket and there are 8 colors to choose from: Black, Ginger, Dark blue, Purple, Army green, Light blue, Red and Rose red. There are two unisex jackets selected for kids and the first one is by Jingle Bongala. A colorful design that’s made 100% of Nylon on the outside and 100% Polyester on the inside. 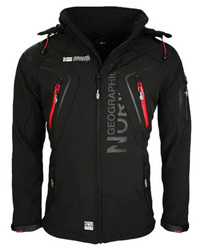 The outer layer comes with a detachable hood, adjustable cuffs and a water-resistant main zipper. There are three outer pockets, accompanied by reflective strips for visibility in bad weather and at night. The inner layer is made of thin fleece that is quite warm and comfortable to wear. It comes in the colors: Red, Green, Royal blue and Lake blue. And next is Lightning by Mountain Warehouse. 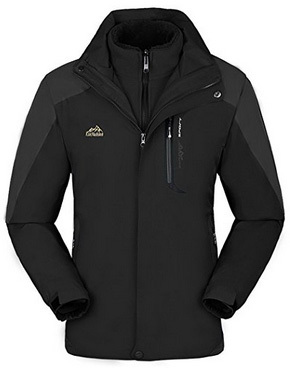 This jacket has a waterproof and windbreaker outer shell, with a main zipper that is covered by a storm flap. There is a detachable hood and two outer pockets with zipper closure. The inner layer is made of thick fleece and comes with a high collar for added protection. There are two side pockets when this layer is worn alone. It is available in 3 colors: Navy, Bright pink and Gray.